Abstract: There's no question that if you want the best memory in the world there is a very short list of capable manufacturers from which to choose, and Corsair Memory is one of them. There's no question that if you want the best memory in the world there is a very short list of capable manufacturers from which to choose, and Corsair Memory is one of them. From our standpoint a manufacturer who is able to consistently produce quality memory is only half of the equation however, after all what happens when problems arise? Is the manufacturer there to support their products or are you simply stuck in limbo? Good customer service is a lost art these days, and it seems that it's easily overlooked by most buyers who only seem interested in focusing on how much something costs. Having RMA'ed enough memory in my time to almost every major manufacturer, I can easily vouch for Corsair's customer service. To me service is just as important as the product I'm buying, and I'd gladly pay a little more with the knowledge that I'll be taken care of should I ever have a problem. In this review today we're testing a set of 'matched' 512MB Corsair TwinX 1024-3200LL memory modules. This flavour of DDR is "officially" compatible with motherboards which have dual channel memory controllers according to the manufacturer. On a side note, we've been using Corsair XMS3500 CAS2 DIMM's to test dual channel DDR based motherboards in the PCstats.com Labs for several months and haven't yet had any compatibility problems. 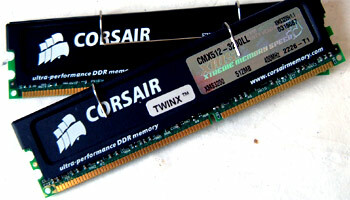 Corsair use black-aluminum heat spreaders on all their TwinX and XMS line of memory modules. Since even highly clocked TSOP-II DRAM do not generate a lot of heat, this is more for looks then sheer functionality, but hey, who are we to complain? It's well known that Winbond are making some of the best regarded DRAM on the market, and so it's nice to see Corsair have chosen to equip their TwinX 1024-3200LL memory modules with Winbond "BH-5" DRAMs. Yes, this is the same DRAM that's found on Corsair's own XMS3500 CAS2 and the BuffaloTech PC3700 memory modules we recently reviewed. The Corsair TwinX 1024-3200LL modules are officially rated to run at a maximum speed of 200 MHz while maintaining aggressive memory timings (2-2-2-6-1) and using a voltage of 2.5V. Of course being my usual self, I wasn't satisfied with the norm - so I cranked up the speed and pushed these modules to the max! Using Epox's 8RGA+ motherboard as the test platform, I began to raise the FSB ever so slowly. At 210 MHz FSB I ran into a few stability problems but setting the memory voltage to 2.7V helped to stabilize things. At 217 MHz FSB we stumbled into a few problems but again we were able to fix things by raising the memory voltage to 2.9V. In the end we were able to run the Corsair TwinX 1024-3200LL at an amazing 220 MHz FSB while maintaining the most aggressive memory timings of 2-2-2-5. We did encounter a slight issue with the memory and nForce2 based motherboards. All nForce2 boards automatically set their memory timings to 3-4-4-8 when initializing at 200+ MHz FSB's, and it seems like the TwinX 1024-3200LL do not like those extremely lax timings. After talking to Corsair, we found that this is caused by nVIDIA's reference BIOS settings rather than the memory. To get the Corsair memory to run at 2-2-2-5 we simply flashed the nForce 2-based motherboard with the latest BIOS version which resolves this issue. Although we tested the Corsair TwinX on an I845PE, we have also run these modules on Springdale and Canterwood system without any problems.